Wow your family and friends, make GRAIN & GLUTEN FREE tortilla chips from scratch! Yes, it’s totally easy, I promise!! You can finally have a crispy paleo tortilla chip (that’s 21DSD Friendly) that you can dip in salsa & guacamole, even make tortilla strips for in tortilla soup! 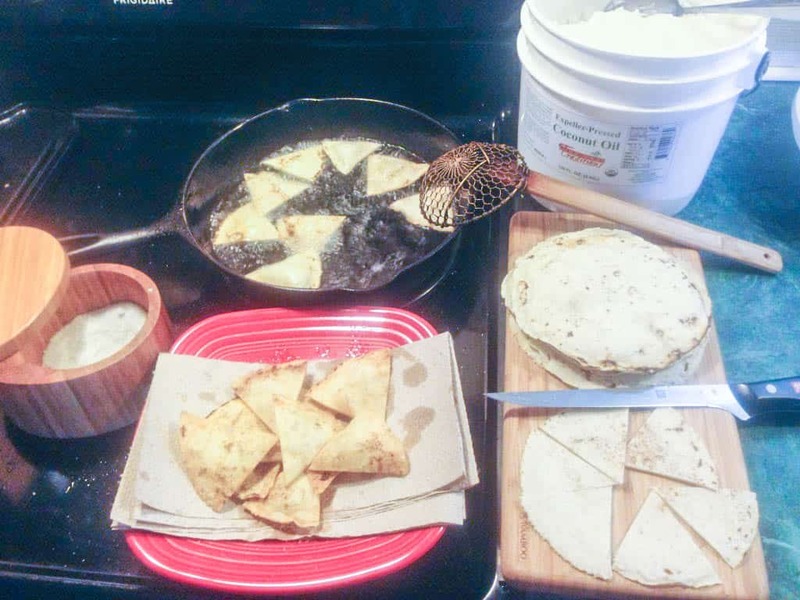 In a low sided skillet (preferable cast iron) heat about 1/2 to 3/4 in of coconut oil/tallow/lard/palm oil over medium/high heat (approximately 350 degrees)… Cut your tortillas into 6 or 8 wedges… Fry tortilla wedges in a single layer, turning so that both sides are lightly brown. Remove crispy chips from the oil and place on a paper towel lined plate, season with sea salt. Enjoy! I haven’t tried frying the raw dough – let me know how it works out for you! just thought you should know, arrowroot powder is corn starch. not really a grain free option. Arrowroot is NOT cornstarch. Arrowroot is an easily digested starch extracted from the roots of the arrowroot plant, Maranta arundinacea. I’m sorry you are misinformed. So it is totally 100% grain free, Craig.